What is a close up magician? Close up magic happens right in under your nose and in your hands. I mingle between your guests and their tables and deliver astonishment and fun. For more information look here. Do you do stage magic? Yes, I can deliver a stage show as well. If you want all your guests to share the same experience at the same time, this is the right choice for you. Here you can find more information regarding my stage show. What does it cost to hire you? The prices for my shows vary. They depend on the date, the location, the duration and the kind of show I provide. Therefore I need to have more information on your event, before I can tell you the price I charge. Unfortunately I am only human and humans tend to get sick sometimes. If this should happen, I will arrange another high class magician to jump in for me. However, so far this has never been the case. Can I book you anywhere in Germany? Yes. I do live in Berlin, but I travel to other cities for my shows as well. 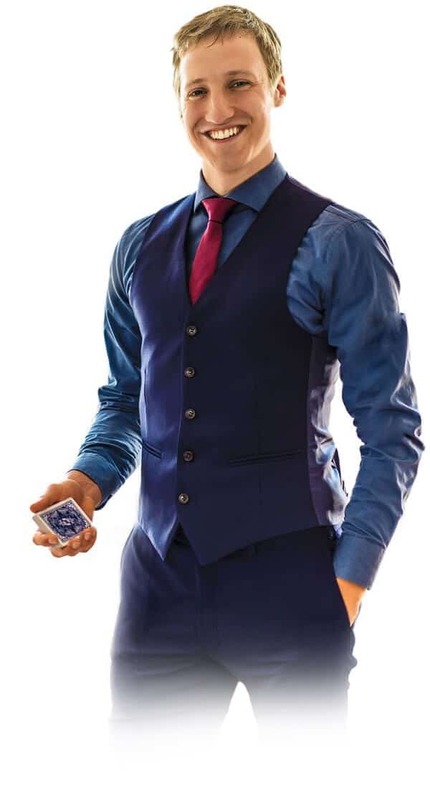 If you need a magician for an event in Potsdam, Bremen, Hamburg, Köln, Frankfurt, Kiel, Stuttgart, Leipzig, Wolfsburg, Heidelberg, Magdeburg, Rostock, Dresden, Lübeck, Düsseldorf, Saarbrücken, Ulm, Fürth, Koblenz, Heilbronn, Göttingen, Trier, Heilbronn, Aachen, München, Darmstadt, Offenbach, Düsseldorf, Karlsruhe, Berlin, Nürnberg, Erfurt, Würzburg, Ingolstadt, Dortmund, Essen, Mannheim, Augsburg, Freiburg, Leverkusen, Weimar, Chemnitz, Halle, Solingen, Braunschweig, Gelsenkirchen, Münster, Bonn, Bielefeld, Hannover, Paderborn, Duisburg, Bochum oder Wuppertal, I would be glad if you contacted me so we can work out the details. Can you teach me magic? Yes! I offer magic workshops, where you can learn easy to do magic. They are well suited for teambuilding events or work parties. You can call me for more information and to let me know your specific needs. Is it necessary to be talented to become a magician? No. This may be one of the biggest secrets in magic. But I am strongly convinced that, as in every other field, you will be successful, if you enjoy what you are doing and are willing to do everything necessary to succeed. In magic that means to have fun practicing, learn from failures, be self-critical and enjoy being around people. When did you decide to become a professional magician? Like many kids, I used to own a magic kit. However, after just one christmas show for my family it went back to the drawer and I proceeded with my other career goals: Becoming a professional soccer player, becoming an archaeologist and being a biologist. I had and still have many interests, most in scientific fields. My magic career rested until I reached the age of 19, when a my cousin showed me a magic trick at christmas. I enjoyed the effect and was able to entertain friends and acquaintances with it. I caught fire and secretly played with he idea of becoming a professional magician, while I finished my degree in biology and later sports. I made that idea a reality and do by now, enjoy providing magic to interesting people at exciting events.